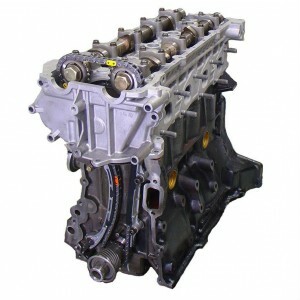 The KA24DE engine produced by Nissan is a 4 cylinder 2.4 L engine used in a variety of applications. How did this engine get its name? Well, the KA24DE name is part of an engine code created by Nissan. The “KA” is the family name. There were 3 engines in the KA family, the KA20DE, the KA24E, and the KA24DE. The KA24DE had the most power. The “24” denotes the displacement, 2.4 liters for the engine we are reviewing here. “D” indicates the valvetrain is dual overhead camshaft while E indicates electronic fuel injection. T is also used for turbocharged where applicable, but this engine does not have the T, and is therefore naturally aspirated. For North American applications, the KA24DE was available in the Nissan Xterra, Frontier, Altima, and 240SX. For other markets, this engine was available in Nissan R’nessa, Presage, Bassara, and Bluebird. The SR24DE engine was first made available in 1991 in the Nissan 240SX. This is probably the most popular automotive application for this engine, and the engine was available in this car from 91-98. This engine was available for quite some time after that, as the last application was in the Nissan Frontier, which lasted until 2008. When reading reviews of this engine, the reliability of this engine is quite impressive. Many have well over 250k miles on this engine and have only made minor replacements. There are also quite a few aftermarket parts available for tuning of this engine, and in some cases this engine has been swapped into a different body. One unique characteristic for this engine when compared to many common U..S built engines was the crankshaft. This engine used a crankshaft girdle, as opposed to individual main bearing caps commonly used. This engine has reasonable power numbers for a naturally aspirated option of this displacement, but certainly nothing overwhelming in its stock condition. The maximum horsepower from this engine was 155 hp at 5600 RPM with a peak torque of 160 lb-ft at 4400 RPM. The compression ratio in the 240SX offereing was 9.0:1 until 1993 and was then increased to 9.5:1 for the duration of its time in the 240. The precise volume of this engine was 2.389 Liters, which converts to 145 cubic inches. This ratio of slightly greater than 1 hp per cubic inch is not bad on a relative basis. The engine has a 3.5 inch bore to go along with its stroke of 3.78 inches. This engine had some design improvements which enabled the improvements in power, such as larger crankshaft girdle and piston oil squirters. The overall result was that the engine’s 155 hp was an improvement of 15 hp over the KA24E. This engine also provided an additional 8 lb-ft of torque. The KA24DE is built with cast iron block and an aluminum head. The valvetrain for this engine, as already alluded to, is dual overhead camshaft. This 4 cylinder engine has a total of 16 valves, with 2 intake and 2 exhaust valves per cylinder. This was another one of the improvements for the KA24DE compared to its predecessor, the KA24E. The KA24E had only 3 valves per cylinder and used single overhead camshaft technology. The K24DE was a 4 cylinder engine produced first in 1991 in the 240SX and the engine lasted until 2008. Overall this was an appropriately powered engine for the displacement it offered, 155 hp for a 145 cubic inch engine, but you can definitely find tuned up versions of this engine capable of more power. The reviews on this engine point towards the reliability of this engine based on the high mileage people in their cars.